I am a Distinguished Scientist at Microsoft Research, Redmond. My technical work is done in collaboration with members of the Data Management, Exploration and Mining group. Prior to joining Microsoft Research in Jan 1996, I worked at HP Labs, Palo Alto. I received my Ph.D. from Stanford University and my B.Tech. from IIT, Kharagpur. I started the AutoAdmin project in 1996 soon after joining MSR. The goal of this project is to make databases self-tuning and self-administering by exploiting knowledge of the workload. 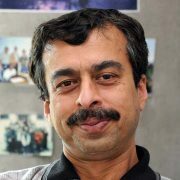 Vivek Narasayya was my primary collaborator in early years and subsequently we were joined by other colleagues in this effort. Our primary focus was in automated physical database design as well as automated statistics management in relational systems. The Index Tuning Wizard in Microsoft SQL Server 7.0 and SQL Server 2000 are based on the technology that we developed as part of this project and represented the first workload-driven commercial physical design tools on relational systems to recommend indexes and indexes + materialized views respectively. The scope of the automated physical design technology has since been expanded and made available in the Database Tuning Advisor feature of the SQL Server 2005 and subsequent releases. The AutoAdmin project page has a detailed description of the project and the publications. Recently, I have gotten interested in the related problem of resource management for Multi-Tenant database systems as well as the challenge of auto-tuning cloud database systems. I initiated the Data Cleaning project in 2000 with the goal of developing tools and server infrastructure to support data preparation, an essential step before effective data analysis. Venkatesh Ganti was our leading reseracher in this project in the early years. Our work led to fuzzy matching and fuzzy de-duplication transforms in the SQL Server 2005 product (and subsequent releases) in the SQL Server Integration Services component. In recent years, we have incorporated our Data Cleaning technology in Bing. Text documents as well as structured relational data are sources of our information. Understanding the synergy between these two sources of information has been a longstanding interest of mine. I started looking at this problem in mid-nineties(SIGMOD 1995) when we studied the problem of “join” between Relational tables and Text repositories. Later, we investigated the problem of keyword search over structured databases (IEEE ICDE 2002) and the problem of auto-ranking of answers in database queries (CIDR 2003, VLDB 2004, CIDR 2005). More recently, we have been looking at the problem of entity search (WWW 2008). Ideas from this project have been incorporated in Bing. Last but not the least, I am interested in the problem of supporting business intelligence and decision support queries more effectively on data platforms. In the past, I have worked on optimization of complex SQL queries, e.g., optimization of queries with group-by (VLDB 2004), user-defined predicates (VLDB 2006), exploiting factorization for index unions/intersection plans (SIGMOD 2003), and data mining predicates (IEEE ICDE 2002). One of the directions I have pursued is that of revisiting the fundamental assumptions in query optimization (SIGMOD 2005, SIGMOD 2009). Currently, I am exploring techniques and tools for “Big Data” enterprise analytic platforms. Information at your Fingertips: Only a Dream for Enterprises? Keynote, IEEE ICDE 2015, Seoul. How Different is Big Data? Keynote, IEEE ICDE 2012, Washington D.C. Experiences with Problem #9: Invited Talk, ACM SIGMOD 2011, Athens. A Programming Framework for Data Cleaning, Distinguished Lecture, University of British Columbia, 2009. An Overview of Data Warehousing and OLAP technology. Sigmod Record, March 1997 Tutorials Presented at 1996 VLDB, 1997 SIGMOD, 1998 EDBT and 1998 IEEE ICDE Conferences (with Umeshwar Dayal). I started the AutoAdmin project in 1996 soon after joining MSR. The goal of this project is to make databases self-tuning and self-administering by exploiting knowledge of the workload. Vivek Narasayya was my primary collaborator in early years and subsequently we were joined by other colleagues in this effort. Our primary focus was in automated physical database design as well as automated statistics management in relational systems. The Index Tuning Wizard in Microsoft SQL Server 7.0 and SQL Server 2000 are based on the technology that we developed as part of this project and represented the first workload-driven commercial physical design tools on relational systems to recommend indexes and indexes + materialized views respectively. The scope of the automated physical design technology has since been expanded and made available in the Database Tuning Advisor feature of the SQL Server 2005 and subsequent releases. The AutoAdmin project page has a detailed description of the project and the publications. Recently, I have gotten interested in the related problem of resource management for Multi-Tenant database systems. Experiences with Problem #9: Invited Talk, SIGMOD 2011, Athens.